Hyperemesis gravidarum (HG) is a severe form of nausea and vomiting in pregnancy. It affects around 1% of pregnancies and is the most common reason for a woman to be hospitalized during pregnancy. Many more of us have heard of HG since Kate Middleton went through her two pregnancies suffering from it, but it wasn’t until I started reading more about it for this blog that I learned just how long-lasting this is for many women and its effects so severe that some women suffering from HG terminate their pregnancies. “Plenty of people can imagine that crippling nausea and near constant vomiting for anything more than two days is not nice, even if it “for a good reason”! But really the nausea and vomiting is only one aspect of a life changing, family limiting, sanity destroying condition which takes over your every waking moment for nine long and extraordinarily lonely months. HG is not only nausea and vomiting. It is a sense of smell so powerful and warped that your loved ones can’t come near enough to comfort you without triggering retching. It is not being able to swallow your own saliva without puking it back up, so you just have to spit constantly into a towel or a cup. It is not just days lying still in a dark room but weeks and even months of it. It is not being able to eat or drink for days and being racked with guilt about the unknown harm you’re imagine your doing to your baby before it’s even formed. And then seeking help and being faced with more guilt about taking medication during pregnancy thanks to old stigmas and a lack of awareness. It’s having a life threatening condition which people tell you constantly to take ginger for! The mental toll that all of the above takes is understandably profound. And yet, what I’ve described above is only a fraction of what HG is to the thousands of women who suffer it every year. There is also the financial toll on families, the damaged relationships, the long term complications and damage to your gastro-intestinal tract, the memories of smells that can trigger nausea and panic many years after. It becomes easy to see why Post Traumatic Stress Disorder is common after HG not just for women but their partners too. I couldn’t wait to have babies, I had always looked forward to pregnancy, sickness and all. So when my husband and I got the little blue line and a few days later I was sick for the first time we were delighted… Morning sickness… No problem. I’d take it like the tough mama I was gunna be. What’s a bit of sickness in the scheme of growing a new life after all? A few days later I hadn’t stopped throwing up and before even my first hospital admission I was fantasizing about miscarriage or terminating my precious baby. I’d imagined I’d be an all natural, organic eating, cotton wearing earth mother avoiding all medication, alcohol and hair dye… Until I was faced with a prescription for an antiemetic and my feelings of guilt exploded exponentially. What do we know about treatments for HG? So what help is there for women, like Caitlin, who suffer from HG? A range of different strategies are currently used to try to lessen the effects, including drugs, complementary therapies and dietary modifications. Is there good evidence to help people decide which of these they might try? That is what a team from the Cochrane Pregnancy and Childbirth Group set out to investigate in a new review, published this week, that brings together the best available evidence on treatments for HG. A previous review looked at less severe nausea and vomiting in pregnancy (you can read about that in this blog) and this one looked only at research on HG. The reviewers were interested in randomized controlled trials on any intervention for HG and the impact on sickness (the number of episodes of sickness and whether they affected the severity of sickness, reduced or stopped it) and days in hospital. They also wanted to know about readmission to hospital and the need for extra anti-sickness drugs or feeding via a tube or drip; any ill effects on mothers or babies, and impact on quality of life, including a decision to terminate the pregnancy. The review includes 25 studies with 2052 women. There were 18 different comparisons, with interventions including acupuncture/acupressure, intravenous fluids and various drug treatments, and only a small amount of data on each. There were no studies at all of dietary or other lifestyle interventions – how surprising! The Cochrane reviewers note shortcomings of the evidence that highlight the need for consistency in how HG is defined, for a core set of outcomes using validated measures, and for larger placebo-controlled trials. 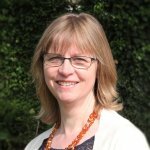 Caitlin Dean welcomes work that is under way to tackle the need for core outcomes and an agreed definition of HG, by the team which conducted a recent systematic review on corticosteroids for HG and, like the Cochrane reviewers, highlighted these issues as essential for making research useful. Caitlin, along with the PSS trustees and volunteers, strongly disagrees with proposals to conduct placebo-controlled trials of antiemetics. “They’ve been around for years and they have been established as antiemetic drugs in placebo drug trials in other lower risk conditions, where the risk of terminating a wanted pregnancy doesn’t exist. We don’t need placebo trials to see if antiemetics are still antiemetics. For more on this see my most recent Spewing Mummy post on this topic in which I ask for women’s views on placebo trials in HG. It’s a unanimous no… It won’t work because women won’t be recruited to it and it’s unethical. This is what Pregnancy Sickness Support aims to do. Tomorrow, ahead of International HG Awareness Day on 15th May, they will be hosting their biennial volunteer conference in Bristol, following the opening of the Pregnancy Sickness Unit at St Michael’s Hospital, Bristol. The charity is continuing to campaign for more units like this one, and for better treatment and support for women with HG. You can follow the conference on Twitter @HGSupportUK #HGConf16, where you can also find Caitlin @SpewingMummy. Let’s hope that future updates of the Cochrane review will be able to provide better evidence for women about available treatments, drawing on research that uses an agreed definition of HG and a core outcome set developed with women with experience of HG working alongside researchers. Meanwhile, the work of people like Caitlin and the PSS volunteers can do much to raise awareness and support women with this condition. Hyperemesis gravidarum: sufferers need support, compassion and better research by Sarah Chapman is licensed under a Creative Commons Attribution-NoDerivatives 4.0 International License. Based on a work at http://onlinelibrary.wiley.com/doi/10.1002/14651858.CD010607.pub2/abstract?systemMessage=Wiley+Online+Library+will+be+unavailable+on+Saturday+14th+May+11:00-14:00+BST+/+06:00-09:00+EDT+/+18:00-21:00+SGT+for+essential+maintenance.Apologies+for+the+inconvenience..
Permissions beyond the scope of this license may be available at http://www.cochrane.org/CD010607/PREG_interventions-hyperemesis-gravidarum. 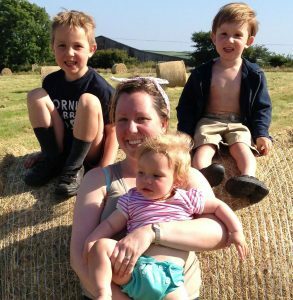 The photograph of Caitlin Dean and children is reproduced here with Caitlin’s permission. Other images were purchased for Evidently Cochrane from istock.com and may not be reproduced. Boelig RC, Barton SJ, Saccone G, Kelly AJ, Edwards SJ, Berghella V. Interventions for treating hyperemesis gravidarum. Cochrane Database of Systematic Reviews 2016, Issue 5. Art. No. : CD010607. DOI: 10.1002/14651858.CD010607.pub2. Grooten IJ, Vinke ME, Roseboom TJ, Painter RC. A systematic review and meta-analysis of the utility of corticosteroids in the treatment of hyperemesis gravidarum. Nutrition and Metabolic Insights 2016; 8 (Suppl 1): 23-32. DOI: 10.4137/NMI.S29532. My daughter is having twins and it’s her 1st pregnancy. She was so happy when she found out she was pregnant. She is now 25 weeks and is yet again in hospital. She has been sick so often she is also coughing up blood. Dur to the lack of food and water her keystones are also now extremely high. She had to leave work today as she is now spending so much time in hospital. While in hospital the medication is given in a drip and this helps, however the tablet versions do not. She is unable to keep them down. Much more research is needed and quicker support for mums to be. It has affected every part of her life. It’s awful for her. As well as the other after effects it could also make bonding with the babies much harder for a new mum. So much bonding is done juring the pregnancy and my daughter is missing out on this. That sounds really tough… I hope she can find some good support from others who have experienced this and finds the blog useful.